What's to Love: Our long tradition of breaking new talent-like Rafael Albuquerque (The Savage Brothers, American Vampire), Emma Rios (Hexed, Pretty Deadly), and Declan Shalvey (28 Days Later, Moon Knight)-continues with the debut of Alex Paknadel and Eric Scott Pfeiffer, two new creators whose extensive world-building in the sci-fi thriller Arcadia evokes comparisons to epics like Game of Thrones, The Matrix, and Astro City. 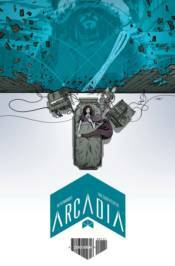 What It Is: When 99% of humankind is wiped out by a pandemic, four billion people are 'saved' by being digitized at the brink of death and uploaded into Arcadia, a utopian simulation in the cloud. But when Arcadia begins to rapidly deplete the energy resources upon which the handful of survivors in the real world (aka 'The Meat') depends, how long will The Meat be able-and willing-to help? Collects the entire eight-issue series.